Sharing photos using email, .Mac Web gallery, DVD Slideshow Builder, and more. Much of the book covers the basics of each application and is a good guide for new users of iLife. However, those of us familiar with iLife certainly won’t be disappointed. Along with the basics, Jim Heid also throws in a number of program and design tips to help us get more out of each application. I particularly liked the section on iMovie because, although I am familiar with previous versions of iMovie and have used them successfully, the iLife ’08 version has changed so much that perhaps Apple should have given it a new name. For that reason, I found this book very helpful. Granted, the new version allows you to make short movies, and also upload them to YouTube, almost automatically. However, with the previous version, iMovieHD, you had finer control over the whole process. Thankfully, the installation of iLife 08 doesn’t wipe out the older version of iMovieHD. You can also download it from the Apple Web site in order to archive a copy. I also found the section on iWeb to be very useful, since I personally don’t find that program to be very intuitive beyond the basics. The most interesting tip was the use of Instant Alpha (on page 390), which can automatically remove the background in graphics that you want to use for your W eb site. I found this very useful, as I had been previously painting out the backgrounds using Photoshop Elements. I even found out that you could use this same technique in Pages, the word-processing/page layout program from iWork ’08. iDVD and Automator (page 320). 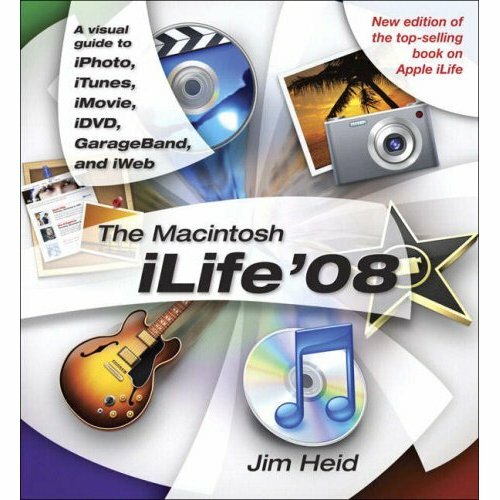 In conclusion, this is an excellent reference book for iLife ’08. There is enough information to make a novice comfortable with the program and there are also enough tips and tricks to satisfy a long- time user of previous versions of iLife.